Literally translated, “Log of Christmas,” this traditional holiday dessert has roots that date back to ancient European traditions. It is fashioned to look like a yule log, which to celebrate the winter solstice, would be burned in the hearth for the twelve nights of the holiday season, and then kept in the home the rest of the year as a talisman to ward off misfortune. Nowadays, this wonderfully kitschy cake is a treat I look forward to making every holiday season. 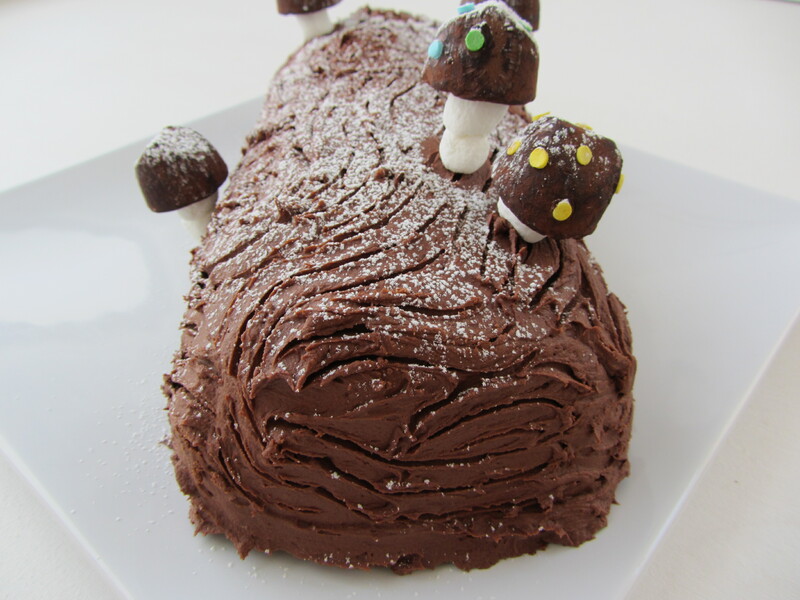 The yule log cake is a cream-filled rolled sponge cake traditionally covered in a chocolate ganache, and decorated with meringue mushrooms. I’ve adapted the formula so that we simpler folk can too make this delicious treat with our more readily available culinary skills. The result is still whimsical and just as sweet to eat! 1. Make the whipped cream filling. Beat the heavy whipping cream until soft peaks are formed, then stir in the powdered sugar and vanilla, and resume beating until stiff peaks are formed. Don’t over beat the cream, it become lumpy and curdle. Refrigerate until ready to use later. 2. Make the cake. Preheat the oven to 350F. Grease a 12×17 inch jelly roll cake pan and line the bottom with parchment. In a large bowl, sift together the flour, cocoa powder, baking powder, and salt. 3. In another large bowl, beat the egg whites until frothy, then add 1/3 cup sugar and continue beating until they hold a stiff peak. 4. In (yet) another small bowl, beat together the egg yolks, 1/3 cup sugar, and vanilla. 5. Mix the egg yolk mixture into the flour mixture, then gently fold in the egg whites until just combined. Do not over-mix. 6. Evenly spread batter into the prepared jelly roll pan. Bake at 350F for 10 – 12 minutes, until a toothpick inserted into the middle comes out clean. 7. Lay out a clean kitchen towel and generously dust it with powdered sugar. Turn the cake out onto the towel, cut off the crisp crusty edges, then dust the entire top with powdered sugar. Gently roll up the cake and towel. Let stand for about a minute, then unroll and re-roll. Set aside, allow to cool. 8. Make the chocolate frosting. In a large bowl, cream the butter. Beat in the cocoa powder, chocolate, and vanilla. Gradually beat in the powdered sugar (it will look chalky at this point). Beat in the milk, one tablespoon at a time, until the frosting is light and fluffy. 9. Build the cake. Unroll the cake, then evenly spread the whipped cream over the entire top. Gently roll up the cake, peeling back the towel as you roll. Place rolled caked, seam-side down onto a platter. 11. 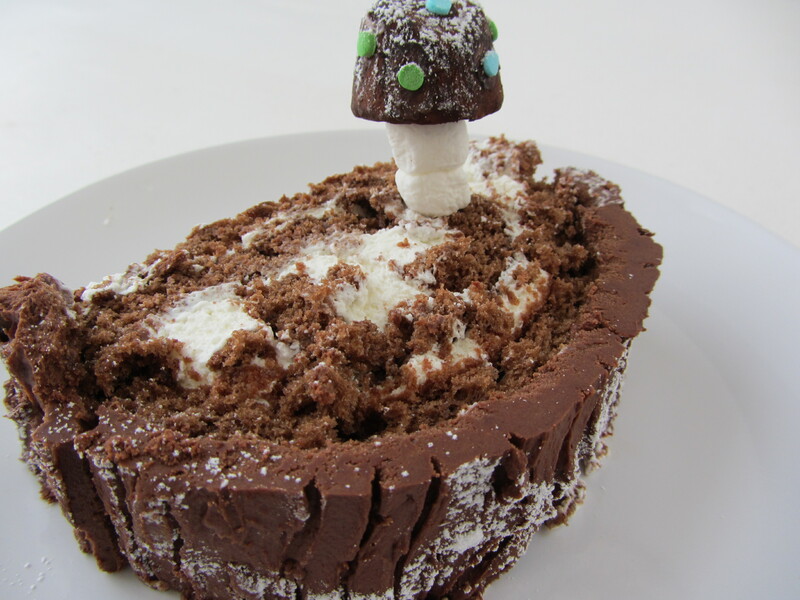 Create the mushrooms by threading a toothpick through one or two marshmallows and then topping with a chocolate truffle, dotted with sprinkles. Stick them into the cake. 12. Refrigerate for 30 – 60 minutes to allow frosting to set. Dust with powdered sugar before serving. 13. Wasn’t that easy? Now go eat! * If the frosting is too sweet for your taste, substitute in 8 ounces of cream cheese for 1 cup of the powdered sugar. * Don’t have chocolate truffles? You can use large gumdrop candies, or store bought meringues to make the mushrooms.